Approximately a month ago, Wink Lorch contacted me in reference to a new online travel guide she had recently launched on La Rioja, Spain. For those of you unfamiliar with Wink, she is the founding member of the Association of Wine Educators and a member of the Circle of Wine Writers. As if this isn’t time consuming enough, in 2007, Wink founded the Wine Travel Guides website, which offers detailed regional wine guides in Old World wine producing countries such as Germany, France, Italy, and now, Spain – all available for download in PDF format. A meticulous, passionate and thorough individual by nature, Wink’s guides speak to her personality, covering: places to stay, wineries to visit, restaurants to dine at, wine shops, wine related festivals and events, outdoor activities, maps, travel directions and general wine making information of the region. Having conducted a regional report on Rioja ourselves, we’re rather sensitive to quality content. But these guides are well laid out, easy to read, and convenient when you’re interested in hopping in a car and getting quality information on the fly. 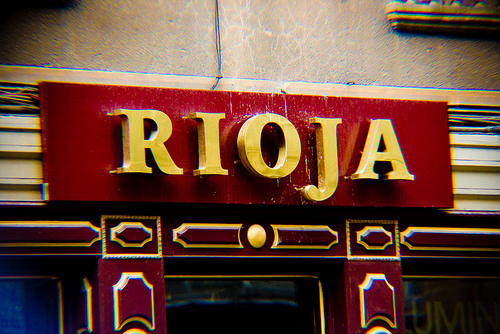 The La Rioja Guide is broken down into two seperate PDFs priced at 7.50 pounds each. One focuses in and around Haro, in the north of the region, while the other focuses on Logroño, the capital of La Rioja located in the center. Both guides have been authored by the Rioja expert himself, Tom Perry, and are approximately 15 pages in length when printed. Another added benefit is that the information is at your fingertips. Meaning that you can access these PDFs via your gadget of choice on the road, and literally be a click away, as all websites and emails are provided for suggested restaurants, hotels, wineries and tourism offices. However, if you’re like me, and need a hardcopy by your side, each location also has a current telephone number and address associated with it, so you can pick up a phone and schedule an appointment without having to search for a signal or internet cafe. Each winery entry also lists when the winery is open, how much a tour costs, a general history of the winery and whether English is spoken (mind you, “English spoken” in Spain is highly relative). Wine festivals are also covered in the guides, such as the famous Haro Wine Battle on June 29th, which commemorates the battle between the Castillians and the Navarrese during the Middle Ages. Although we have yet to experience this “all out wine war” in the streets of Haro, from my understanding, it’s supposed to be an incredible experience, and one worthy of scheduling a trip around. You will also find gastronomical terms listed in Spanish, with explanations in English, for delicious foods such as: Chuletillas de Cordero, Leche Frita and Bacalao a la Rioijana. And to taste these culinary treats, flip to her page on suggested restaurants, listing hours, general pricing and a recommended items to try on their menu. However, as Rioja is quite small, I do wish that both the Haro and Logroño guides were sold together in one guide as most people visit both areas over the course of a few days. Additionally, although Wink does a great job covering the basic wineÂ styles of the region and native grape varieties, I personally, would appreciate a section on common wine vocabulary and expressions in Spanish. As a lover of culture, I like to know basic language terms in the region I’m traveling in; hence a section on simple wine and food vocabulary would be a great addition for me.Â Another suggestion pertains to the Two-Day Itinerary for touring Logroño, where she mentions going on a tapas crawl in the evening – a suggestion I highly recommend as well – but it doesn’t mention where to go on Calle Laurel or some of the history behind this regionally famous street. Finally, I wonder if anyone would be interested in purchasing a small laminated spiral version of these guides as a keepsake of their trip, or as a future reference. As the guides are updated once a year, I can understand the hesitation behind creating a bound version, but I think many people might be tempted if the choice was available.